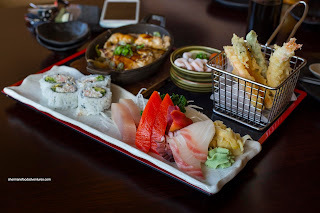 From my time working in Ladner, I was able to try most of the restaurants in the area. Although it will never be a culinary destination, some of the spots did the job and really, what else would one expect? Yes, it was home to a hidden gem in La Belle Auberge, but that sadly shuttered its doors over 5 years ago. Recently, we have seen the restaurant scene change a bit with the addition of Il Posto in the old Dancing Pig location. 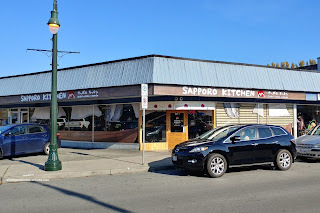 However, there is another spot that has quietly operated under the radar in Sapporo Kitchen. 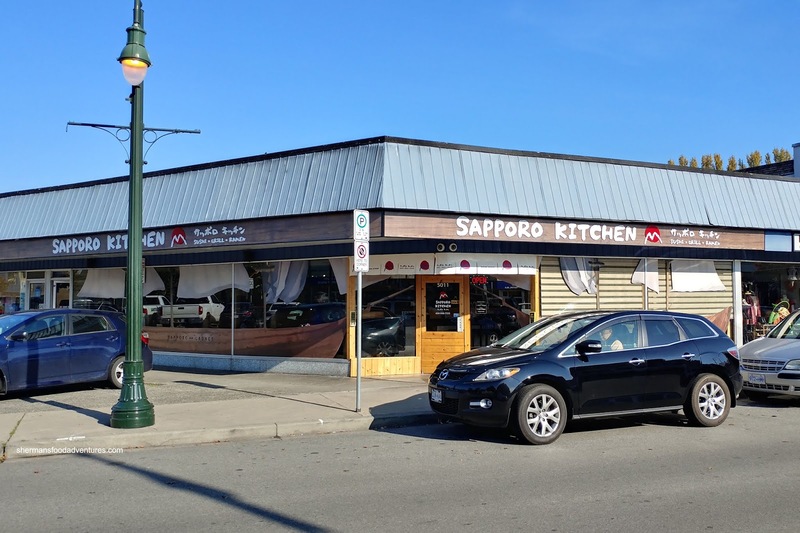 I know, I know, Ladner needs another Japanese restaurant like Richmond needs more new drivers. However, it is nice to see a trendier Japanese spot in the village with a modern menu. 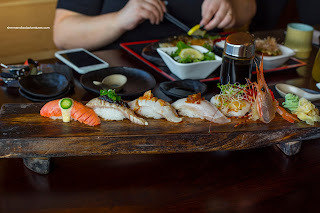 With anything modern and Japanese these days, it is all about the aburi. As such, I went for their Taste of Aburi consisting of salmon, hamachi, toro, tuna, hotate and amaebi. Okay, if you look at the presentation and execution, this would look more at home in a Downtown Vancouver Japanese restaurant, but really, this was Ladner. Although it would never be confused for Miku or Minami, this was quite good. Fish quality was fairly impressive with noted natural flavours without being fishy. The sushi rice was nicely textured with a pleasant chewiness. For those who are wondering, yes, I did get the spot prawn head deep fried. Of course that wouldn't be enough for my lunch, so I decided on the Leo Set for good measure. Oh man, this was quite a bit of food sporting 10pcs sashimi, chicken teriyaki, 4pcs california roll, ebi sunomono, tempura and miso soup. Once again, I was treated to carefully prepared sashimi which included albacore tuna, sockeye salmon, tai, hokkigai and tako. I found the tempura to be also executed on point with a light crispiness while easy on the grease. Well-charred and tender, the chicken teriyaki was non-offensive with just the right amount of sauce. Not much to say about the sunomono and Cali roll because they were textbook, but ultimately good as well. 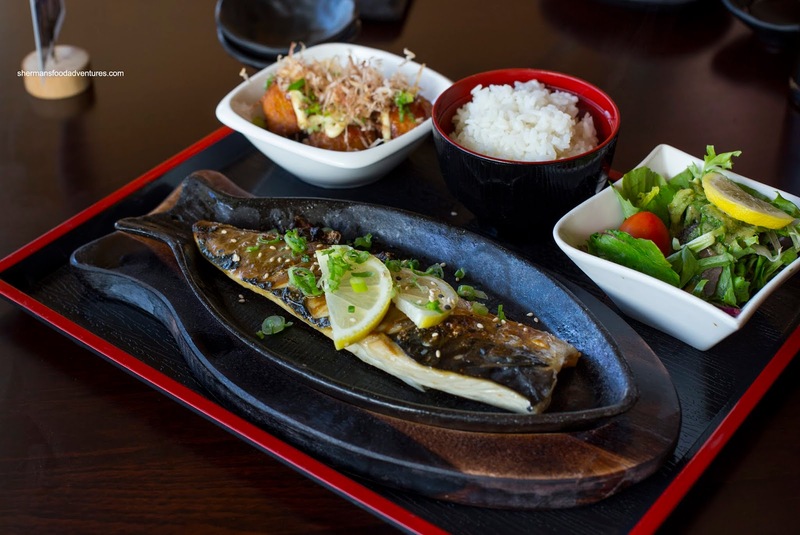 Also on the table, Halfie had the Saba Set consisting of a generous piece of mackerel which was surprisingly moist considering the usual texture of the fish. It was simply prepared and went well with the usual bowl of rice. On the side, she chose the Takoyaki which was too doughy and dense for her liking. However, that was the only blemish to a surprisingly solid Japanese meal out in Ladner. Glad to see that the restaurants are finally catching up to the rest of the Lower Mainland in terms of quality, presentation and overall modern concept.